As an email service provider, Benchmark Email is committed to offering its users reliable, easy to use email marketing. However, we are also constantly expanding and improving our online resources to provide a fully integrated solution to your branding and social sharing ventures. How we aim to further your social and online marketing will be revealed in the coming months. For now both our American and overseas teams are working around the clock to introduce new features and streamline our current editing processes. But what does this have to do with Real Estate? Benchmark Email has steadily grown its library of email marketing manuals. Less than a year ago we had two email tutorial guides. Today we have twenty manuals that cover the full spectrum of email marketing, online marketing, social event marketing and industry white papers. Eventually we will have an email marketing guide for each industry that we service. And here’s where Real Estate comes in. Real Estate is a tricky industry for numerous reasons, but it can make List Approval difficult from our end because of the high rate of purchased, borrowed and rented email lists in their registries. That being the case, Benchmark Email must be highly selective when it considers approving Real Estate contacts. But we have created this manual with the same dedication that we have to email service provision, online marketing, branding and social integration: to educate our users, to provide them with the most up to date and valuable information and to ultimately explore marketing best practices in a detailed yet comprehensible way. 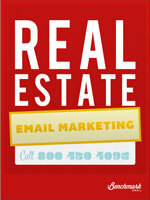 Real Estate: Maximizing Lead Generation with Email Marketing is a free, fully researched PDF on email best practices, with a special section on spam flagging and purchased lists that should prove essential reading for all email marketing realtors. We hope you will take the time to download this guide or read it directly from our website. Benchmark Email is proud to offer you the best marketing resources the industry has to offer and we can’t wait to welcome you to the team. For more guides and manuals, check out our email marketing manual page. I like reading this. Worthy information you have posted. Thanks.